Many of the enquiries received through this web site are from people who have recently acquired or inherited a mechanical calculator, and who are wondering what might be involved in getting it back into working order. The notes following expand on some of my frequently-given answers, and are intended to provide some general guidance. The notes address the sorts of problems that are likely to be encountered, and outline the general procedures that are involved in disassembly, cleaning, repairing, and rebuilding. While the tasks involved can be quite intricate and sometimes rather tedious, they should not present any major difficulties to a person with a reasonable amount of mechanical aptitude and some basic workshop facilities. The notes summarise my own experiences as a hobbyist in overhauling a variety of different machines over a period of many years. I make no claims as to the effectiveness or appropriateness of any of the methods described, and I accept no responsibility for any consequences arising from their use by others. The methods described work well for me, and have enabled the successful restoration of many of the machines illustrated elsewhere on this site. If they work for you (or even if they don't), or if you know of methods more suitable for an amateur workshop, I would appreciate receiving your comments via the enquiry form. It is rare to find anything actually broken in a mechanical calculator. Most problems in a jammed or malfunctioning machine are due entirely to the oxidation and decay of the lubricating oil. The oil hardens with age, causing parts to become slow, sticky, and eventually immovable. 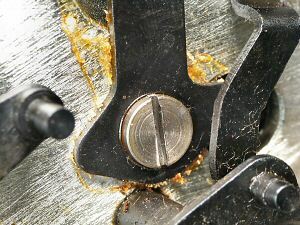 While it may sometimes be possible to get the machine working (after a fashion) by freeing up individual parts, a thorough overhaul will generally involve completely disassembling the mechanism, cleaning out the oil residues from pivots, bearings, and moving parts, and reassembling with new lubricants. "A complicated machine is just a collection of simple machines". The secret to understanding a "complicated" machine is to tackle each of the simple machines separately. In a "calculating" machine you will always find a setting machine, an actuating machine, a registering machine, a tens-carry machine, a clearing machine, sometimes a storage machine or a printing machine. Each of these machines is built up from even simpler machines - ultimately from just gears and levers. Try to identify each of the simple machines, examine their parts, their functions, and their relationships to their neighbours, and gradually the picture of the machine as a whole will become clear. It is strongly recommended that you start your rebuilding with a basic manually-operated machine such as an Odhner pinwheel, a hand-cranked Facit or Monroe, or a key-driven PLUS adder. Consider buying a cheap "practice" machine from an auction or flea market, rather than risking damage to an advanced machine or a family heirloom. It would be best to avoid the larger key-driven machines and printing calculators for your first project, and you should definitely leave the fully-automatic machines until you have had plenty of experience. If you are considering a motor-driven calculator, you will need to think carefully about the electrical aspects. Some late-model machines were quite well designed, with all of the electrical items enclosed in a single well-insulated module. In contrast, most early machines were designed with little regard for electrical safety, and will not meet modern safety standards or expectations. Some machines contain major electrical hazards which can easily result in death, fire, or serious injury. Unless you are thoroughly familiar with electrical wiring and safety requirements, or can obtain help from an experienced person, it is strongly recommended that you avoid motor-driven machines and keep to the hand-cranked varieties. There is little point to overhauling your calculator if you are not going to live to enjoy it. If you are purchasing a machine to restore, try to find one that is in good external condition. A machine that still has its original dust cover has obviously been well looked after, and will generally make an excellent candidate. A machine that is simply dirty but otherwise complete will usally clean up well. Unless it is particularly rare, a machine that has missing keytops, broken handles, and areas of rust or corrosion is probably best kept for practice, or as a source of spare parts. You will be investing a lot of time and effort in the mechanism, and your results will be far more satisfying if you can start with a machine that has its original finish in good condition. Regardless of its external appearance, a mechanical calculator that has sat un-used for 30 or 40 years will generally not be in good working order. It may be stiff to operate, or the dials may not return to zero when cleared. It may be completely jammed - the handle will not turn, or the motor runs but nothing moves. Perhaps the motor runs and the machine cycles, but it runs continuously and will not stop. Perhaps the machine did turn over when you received it, and even added 2 and 2 successfully, but jammed when you tried with bigger numbers. Many enquirers ask for the location of the "reset" button which will put things right and allow them to start again. Unfortunately, there is no such button. Nor is the problem likely to be in just a single component which can be repaired or adjusted. The most frequent cause of trouble in a mechanical calculator is distributed to a greater or lesser extent throughout the entire machine, and relates to the decay of the lubricating oil. Oils and greases thicken as the lighter components evaporate, then gradually decay through oxidation and harden into thick deposits or glazes. Many greases contain clay-based fillers, which can leave very hard residues. The problem is worst where the oil is trapped between adjacent surfaces, such as in bearings and pivots, and where parts lie against a flat surface. At best, some individual parts may become sticky and slow to respond, causing some operations to malfunction. At worst, a majority of the parts will become completely immovable, and the machine will appear totally jammed. To restore a machine to good working order, it is necessary to remove these deposits from all the bearing points, so that the parts can once again move quickly and freely. In the days when mechanical calculators were in constant use they were often covered by maintenance contracts. They were regularly lubricated on-site by the field technicians, and were returned periodically to the dealers' workshops for service. It was standard practice for the workshops to wash out all the accumulated oil and grease in a warm solvent bath (50-50 kerosene and Shellite, a light hydrocarbon), dry the machines in warm air, and to completely re-lubricate them before return. This worked well when the old oil was still liquid, but washing alone will not work half a century later when the oil residues have set like rock. The illustration shows a lever pivoted on a vertical frame in a Madas calculator. Oil residues have formed a hard yellow deposit between the two surfaces and stuck them firmly together. Washing in kerosene has removed the surface oil and turned the residues to a sticky orange jelly, allowing the lever to be rotated slightly clockwise. It is clear that the washing has not removed this material from between the surfaces or inside the pivot, and that the lever is never going to move freely while the residues remain in place. The quickest and most effective way to remove these deposits is to disassemble the components and clean them thoroughly by hand - which generally means completely disassembling and rebuilding the entire machine. Solvents are still required to wash off old oil and grease that is still liquid, and to free up stuck parts so that they can be disassembled. It may even be possible to free up enough parts to get the machine "working" after a fashion, but this will never be a full or permanent cure. The deposits remaining in the bearings will slow the movements and lead to malfunctions, and the residues will harden again as the solvent evaporates. It is worth noting that machines that have sat idle for 70 years or more are generally much less affected by these problems. The differences are most probably due to the change from natural oils (neatsfoot oil, or possibly whale oil) to automotive-style mineral oils in the 1920s and 30s, and to "improved" synthetic oils in the 1960s. It is advisable to do some homework before starting work on an actual machine. At the very least, start by reading the mechanism descriptions on this site, so that you will have a general idea of calculator technology and the sorts of mechanisms that you might expect to find. Some of these descriptions include step-by-step instructions for disassembly and reassembly. Check to see if there are service manuals available for your machine (google Ernie Jorgensen's web site), or study the patent documents to find out how the original designer intended his machine to work. As a hobby project, a full rebuild of a fairly simple calculator such as an Odhner or a small Facit will probably occupy all your spare time for at least a couple of weeks. Allow half a day for disassembly, another half for washing, and at least a couple of days for cleaning, checking, and reassembly. A large fully-automatic machine can easily keep you occupied for a couple of months. There is often a lot of repetitive work, with identical components repeated 8 or 10 or 20 times across the columns of the machine. Make sure that you have the time and the patience to tackle such a project, and that you are not going to be diverted from it once you begin. A calculator doubles in size as soon as you remove the cover, and expands dramatically as the mechanism is disassembled. You will need a "dirty" workbench of at least a square metre where parts can be disassembled, washed, and laid out to dry, and a similar "clean" bench for checking and reassembly. Some of the work needs to be done outdoors in a garage or shed, but most can be done inside on an ordinary desk or table. Cover your work area with a large sheet of white cardboard or cartridge paper (from an art supplies store) so that parts can be easily located. Do not use newspaper, as it tears easily, and small parts can be lost against the printing. Keep the work areas clean and tidy, so that you will have a fair chance of finding the small parts that go missing or end up on the floor. Most service operations on a mechanical calculator can be done with quite basic tools. You will need a good set of flat-blade screwdrivers, a small pair of long-nose pliers, and a fine pair of bent-nose tweezers. A set of dental picks (from a hobby supplies shop) and a small Exacto knife will be useful for cleaning and scraping. Some tasks will require a workbench with a solid vice. Further details and suggestions are given in the sections below. Obviously, the more tools and equipment you have available, and the more familiar you are with using them, the easier the tasks will be. Calculator manufacturers often produced a range of special tools to speed up operations in the distributors' workshops. The special tools were often extremely useful, but were generally conveniences rather than absolute necessities. It is rare to find such tools today - many exist only as illustrations in the few surviving service manuals. If you are handy with a lathe or milling machine you will recognise plenty of tasks which can be simplified by making up a special tool or fixture. The illustration shows two simple home-made tools that are very useful in rebuilding the Facit C1-13. Until about the 1930s, most calculators (and most other machines, for that matter) were designed on the "monolithic" principle. They were assembled piece by piece from the ground up, and generally need to be disassembled in the same manner. In the absence of any specific instructions, it is best just to follow Lewis Carroll's profound advice: "Begin at the beginning, and go on till you come to the end; then stop". 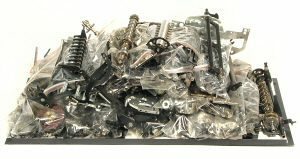 Start at the outside, try to identify the "simple machines" or logical collections of parts that can be removed as a group, and work your way inwards until there is nothing left. From the 1930s onwards, and particularly during the wartime and post-war periods, machine design progressed towards a much more "modular" basis. The fully-automatic Facit CA2-16 calculator from the 1960s can be disassembled into a dozen functional blocks in a very short time, and these blocks can then be disassembled piece by piece. The challenge in getting started is to be able to identify the modules and how they are attached, which is not always easy while the machine is fully assembled. In the absence of service instructions or any obvious clues, it is best to fall back to "begin at the beginning". Once the machine is apart, by whatever method, you will generally be able to see a much better way of putting it back together. It will be necessary to use solvents to free up stuck parts before they can be removed from the machine. Alcohol works as well or better than hydrocarbon solvents, and the vapours are much less offensive when working indoors. Apply a liberal coating of "methylated spirits" or "metho" (an ethanol/methanol blend) to the affected parts with a brush or long-nosed squeeze bottle. Allow it to soak in, apply more, then gently push and pull on the parts and attempt to work them free. Check which way the parts are intended to move, so as to avoid damage from forcing them backwards. It may take quite a long time (sometimes days) for the solvent to work its way into pivots and bearings, but when it does, the parts will come free rather quickly. Be careful with solvents in the vicinity of painted surfaces, especially painted dials and numeral wheels. Some paints dissolve in alcohol, some in petroleum solvents, some even in water. It is vitally important to keep detailed notes during disassembly. Make a note and sketch of each component as you remove it from the machine. Record its orientation, mounting point, and engagement with its neighbours. Record the dimensions of screws and especially springs so that they can be returned to their proper locations. (One popular fully-automatic machine uses more than 40 different sizes of coil springs, which must be returned to their correct locations). Note the presence (or absence) of shims, circlips, flat and spring washers, and other retainers or small parts. Note any differences in rows of "identical" parts, particularly in the first or last items. Look carefully for locating or timing marks on gears and cams. Make a separate list of any parts which will need special attention - this might include parts that appear bent or broken, rivetted pins that have come loose, or rubber parts that have decomposed. Record all this information very carefully, as you will not get the machine back together without it. I find "exploded" sketches more useful than photographs, as it is much easier to focus on the components of interest. My original notes for a Facit C1-13 occupied about 8 pages, while those for the Marchant DRX were about 40. If you have copies of the original service manuals you may be able to save some sketching, but you should still keep your own detailed notes and cross-reference them to the manuals. As you remove and sketch each part, place it aside in a small dish or tray. Keep the dish away from the machine, in case you knock it over and spill the small parts. As you come to the end of each logical grouping, empty the dish into a zip-lock plastic bag, number the bag, and record the number in your notes. Keep the groups fairly small to simplify finding the parts on reassembly. Bags of 90x150mm are a convenient size, and are readily available for a couple of dollars per hundred. Pack the completed bags and larger components onto a suitable tray and put them aside until ready for cleaning. The illustration shows most of the components from the body of a Madas BTG, bagged and ready to go outside for washing. The parts tray is already twice as big as the original machine, and there is still another large box storing the case, carriage, keyboard, and motor. Screws. Cheap screwdrivers tend to have thick blades, which will not fit in the narrow slots in most calculator screws. Some small screws have slots so narrow that even quality screwdrivers will not fit. It may be sometimes necessary to grind the blade of the screwdriver, or to carefully widen the slot with a fine (0.5mm) burr in a Dremel tool. Jewellers screwdrivers are sometimes needed for very small screws. Wear safety glasses when dealing with fine screws, and be prepared for breakages. Circlips. Most machines used open-ended C-clips which are easy to handle. A few machines used ring-ended clips, which require special circlip pliers to fit. Late-model Friden machines used plastic circlips, colour-coded according to size. Always place a finger over a C-clip when removing or replacing to prevent it flying off. Remove by pressing a screwdriver blade across the open end and into the groove. Springs. There is a good reason why these components are called "springs", because that is precisely what they will do when you least expect it. Keep them well under control, as small springs can be very difficult to replace if they become lost. Small tension springs are best installed with a "spring hook", which is easily made by forming a small hook into the end of a suitable piece of fine wire. Catch the loop of the spring with the hook and draw it into position, then help it onto its pin with a suitable tool. Tapered pins. 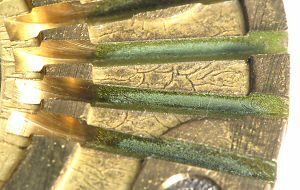 Tapered pins are generally the only components in a mechanical calculator which require workshop facilities for disassembly. They are used to attach gears, flanges, or lever arms onto shafts in a fixed alignment. The parts are assembled in the required positions, a hole is drilled through and reamed to a 1:48 taper (1:50 metric, or about 1°), then a matching pin is inserted and driven home. The pins can be very difficult to remove, especially if they have not been touched for 40 years. The first step is to identify the large and small ends. This is not always easy, especially if the pin has been removed and replaced a couple of times before. If you are lucky, the large end will be marked with a dot punched into the adjacent hub or gear. If not, you will need to examine both ends carefully to decide which is the larger. If the pin has been damaged or distorted by previous removals, it may help to file the ends flat, or even level with the hub, in order to see the actual diameter. Next, it is absolutely necessary to provide a firm and massive support directly under the hub of the gear or flange. Take a piece of flat steel bar about 50mm wide and 3 or 4mm thick, and of a length that will stand upright in a large vice. The bottom end should rest on the throat of the vice, and the top should be about 50mm above the jaws. Clamp this plate firmly in the vice. File a half-round groove in the top, of a suitable size to support the hub, and file or cut a slot below to receive the pin. 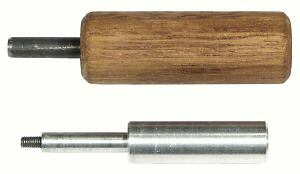 Next, obtain a selection of pin punches and carpenter's nail punches of suitable sizes. The nail punches have a concave end, which will sit over the pin and reduce the chance of slipping off. Have an assistant support the hub of the gear in the groove, with the small end of the pin upwards. Place the punch in position, and hold firmly. For a typical gear pin of say 3mm diameter it will be necessary to strike a solid blow with a heavy hammer. Use less force on smaller pins. Don't be over-cautious - if the first impact fails to loosen the pin, it will simply rivet the thin end and make it even more difficult to remove. Drive out the pin with a smaller parallel punch once it is loose, and tidy up the pin and hub if necessary. It may be necessary to grind down a punch for small pins. After you have removed the pin and confirmed which is the large end, punch a dot next to the large hole to assist with future maintenance. Reassemble in the same manner, but with rather less force. Parallel and serrated pins. Two other styles of pins are sometimes encountered. Parallel or rolled pins are made from a hollow C-section cylinder of spring steel, while serrated pins are made from a piece of solid rod with a splined or roughened surface. Both types should be supported as described above and driven out with a suitable parallel punch. They generally require much less force than tapered pins. Before removing these pins, scribe an alignment mark on the ends of the shaft and hub to assist in reassembly. (The components held by parallel pins are often symmetrical, but the pin holes themselves may be slightly off-centre. Reassembly can be difficult if the alignment is reversed). The first stage of cleaning is to wash all of the mechanism parts in kerosene to remove surface oil and grease. This needs to be done outside, or in a garage or shed with plenty of ventilation. A motor mechanic's recirculating wash tank can be used if available, but you will need to fit a very fine mesh to stop small parts becoming lost. Otherwise, obtain a large plastic dish, preferably rectangular, and at least 300mm long. A plastic or metal tray of the type used with paint rollers is also suitable, and includes a built-in draining board. Collect up a good assortment of brushes - a stiff kitchen dish brush, a hard toothbrush, a soft 25mm paint brush, and a packet of pipe cleaners for the holes. Brushing produces a fine mist of kerosene vapour, so wear old clothes or overalls, use safety glasses or a visor to keep splashes out of your eyes, and set up an electric fan to blow fresh air to where you are breathing. Prop up one end of the dish, and pour in enough kerosene to come halfway up the base. Empty the first bag of parts into the dish and scrub them clean. Use a small knife or dental pick to loosen any hard deposits. Rinse the parts in another (smaller) dish of clean kerosene, wipe off the excess, and lay them out to dry on a large sheet of white cartridge paper. Make sure that the paper is securely held down, so that it cannot be upset by the fan or an unexpected gust of wind. Keep each batch together as a group, and write the bag number on the paper. As you finish each batch, check carefully that there are no small parts left behind in the dish or stuck between the bristles of the brush. The illustration shows several groups of parts from an automatic Facit machine laid out to dry. (The central groups are much larger than I would recommend for your first project). When the kerosene becomes too filthy, empty it into a clear plastic bottle and start afresh. Put the bottle away until the dirt settles, then pour off the liquid into a clean container and use it again. When you have finished washing, close the door and leave the parts to dry naturally. Overnight is generally sufficient in warm weather. When they are dry, put each group back into a new clean bag, and label it with the batch number. After the parts have been washed and dried, they need to be cleaned of all remaining deposits, and checked for any signs of wear or damage. This is best done as each bag is prepared for reassembly. Oil residues. Take each part and examine it carefully for any traces of residual oil deposits. Oil residues may appear as a clear waxy film, a sticky white or yellow powder, a red or green glaze, or a thick black crust. Scrape these away with a fine knife or dental pick, brush them off with a hard toothbrush, and wipe clean with metho on a rag, cotton bud, or pipe cleaner. You will be amazed at how much dirt remains after your careful washing. As an example, this close-up illustration shows the radial grooves in a newly-washed pinwheel from a Facit calculator. Note the green glaze that has formed where the oil has been trapped between the pins and the sides of the grooves. There will be similar deposits on the adjacent pins and setting rings. The glaze is usually very hard, and makes quite a distinctive sound as it is scraped away. Be careful not to damage the sides of the grooves. Some metal surfaces will be blackened or otherwise discoloured as a result of a chemical reaction with impurities in the oil. This discolouration will generally remain after the residues have been removed. Bearings and pivots. Pay careful attention to all bearing and pivot surfaces, especially the inner surfaces. Loosen deposits in holes with a (hand-held) drill bit of the correct size, then wipe clean with metho on a cotton bud or pipe cleaner. It may take a long time to clean out a whole set of star wheels. Polish all pivot points with the finest emery cloth available (at least #1200, preferably 2000 or 3000) and check that the parts fit and turn freely. Shafts, flanges, and pins. Check shafts for burrs and nicks, especially at the ends and in the vicinity of pin holes. Touch up with a fine file and polish with emery cloth. Touch up the pins and flanges as necessary. Check that the shafts fit easily into their bearings, and that moving parts slide freely along the shafts. Levers and springs. Remove any burrs that have formed on levers at their at contact points, and remove any rough spots from sliding surfaces. Re-form the loops at the ends of springs (if necessary) to ensure that they can not be accidentally dislodged from their mountings. Wipe the springs with an oily rag to help prevent rust. Rivetted levers and rollers. Cleaning is difficult where levers and rollers are permanently rivetted to a frame plate or another lever, especially if the parts have a limited range of movement. Coat the area with metho and work the parts vigorously, applying pressure in all directions. You will see generally see black oil or white powder gradually wash out from the pivot. Repeat until no more dirt emerges, then leave it to dry overnight. You will probably find it sticky again in the morning. Repeat as necessary until the parts remain free, then oil lightly and continue. Screws and threads. Clean deposits from screw threads with a fine wire brush, or a dental pick and toothbrush for fine screws. Blackened screws can be refinished with "gun blue", taking careful note of the safety instructions. Run a tap through threaded holes to remove internal deposits if you have the correct size and profile, otherwise clean them out with metho on a pipe cleaner. Synthetic materials. Pay careful attention to any parts made from synthetic materials, especially nylon and polyurethane. These materials change with time, and may eventually leave a machine not just inoperable but unrepairable. Nylon and similar plastics were used for gears, cams, and dials in some late-model calculators, but trouble arises as the nylon shrinks with age. Dials intended to turn freely can sieze onto their shafts and prevent the machine from operating. If the parts can be removed without further damage they can usually be drilled out to restore the clearance. Components that were tightly attached to a shaft can present a more serious problem, as shrinkage may cause them to split and become loose or mis-aligned. The illustration shows a typical failure on a camshaft from a Contex 10-key machine. This problem is often fatal, especially when it occurs with complex moulded components. Polyurethane was widely used in the 1960s and 70s as a substitute for rubber in belts, buffers, and cabinet feet. It de-polymerises naturally over a period of 20 or 30 years to form a sticky black mess. Polyurethane drive belts have usually disintegrated into a tangle of sticky wire or fibreglass threads. Replacements for standard XL or MXL profiles are generally available, but some machines used custom profiles. Polyurethane foam used as sound deadening material on the insides of cabinets has usually turned brittle, and is best removed before it decomposes further. Polyurethane residues can be cleaned off with plenty of metho. Replacements for simple parts can sometimes be made from neoprene rubber. Electrical equipment. Motor-driven machines must be checked carefully for exposed live parts, perished or brittle wiring, damp or defective motor insulation, damaged power cords, missing earth connections, capacitors that have failed (or are likely to fail as soon as energised), and resistors which have burnt out as a result of overheating. Unless you are thoroughly familiar with electrical wiring and safety requirements, or can obtain help from an experienced person, it would be best to have the machine checked and re-wired by a competent electrical workshop. In many cases the problems of exposed live parts (eg around switches and motor governors) are insurmountable, so that extreme care must be taken when testing and adjusting with the covers removed. Keytops. The keys (or keyboard modules) should be washed in kerosene to remove loose oil, then scrubbed with an ammoniated household cleaner to remove the accumulated finger grease and discolouration. A rub over with automotive polish will improve their appearance. On single-moulded keytops it may be necessary to re-fill the numerals with black or white acrylic timber putty or a slow-drying oil-based paint. Linings. Calculator casings are usually lined with material to absorb sound, and the bases with material to absorb oil. Many types of natural and synthetic materials have been used, including pitch, felt, fibre, cardboard, linoleum, lead sheet, or polyurethane foam. Cardboard and linoleum tend to curl inwards with age and may foul on the mechanism. Adhesives may fail, especially if affected by oil, leaving the linings loose inside the case. Plastic foam turns sticky or degenerates into powder, and is best removed entirely before it causes trouble. The base linings of older (pre-1930s) machines are sometimes very smelly due to the decay of the original animal-based oils. Remove or replace any lining material that is in poor condition. Casings. Wash (or preferably wipe) the casings with kerosene to remove surface oil, being careful not to saturate the linings or dissolve any tar-based lining adhesives. Allow to dry, then wash thoroughly with soap and water or mild household cleaners. Be careful to keep the surfaces uniformly wet, especially with matte-finish paints. Severe streaking can result if detergents are allowed to run or surfaces to dry unevenly. Polish bakelite or gloss painted surfaces with (non-silicone) automotive polish. Cut replacements for scratched or discoloured register windows from recycled clear plastic packaging or thin acrylic sheet. Rubber parts. Rubber and polyurethane parts will often be in poor condition, especially if they have been in contact with oil. While direct replacements are rarely available, suitable alternatives can sometimes be found among the many types of feet, grommets, and such like at a rubber parts store. Replacements for many simple parts (eg Odhner pinwheel feet) can be cut from 3 or 4mm neoprene sheet. the cost of professional assistance. Unlike a vintage clock, a vintage calculator is probably not going to be expected to run 24 hours a day. Worn parts can generally be returned to service in a machine that is only required for light use and occasional demonstrations. It may sometimes be possible to move a worn part (eg the first register dial or carry lever) to a location where it will be receive less use. Severely worn parts can often be tolerated provided there is no chance of jamming or mis-operation. 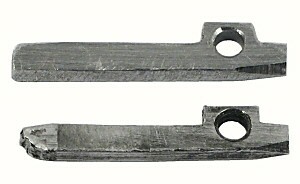 Some calculator parts are case-hardened and will wear rapidly once the hardening is damaged, but even this may be acceptable with only light use. The only area in which compromise is not acceptable is in the electrical equipment, which must be brought up to the highest possible standard. Parts which are broken or worn to the extent that they no longer operate reliably can present a problem, as original replacement parts are no longer available. Some calculator collectors have sacrificial machines which can be cannibalised for replacements, or you may be able to find a suitable "parts" machine at an auction or flea market. If your machine turns out to need extensive repairs or replacements, it may be easier to use it as the "parts" machine and to look for a better one to rebuild. If replacements can not be found, it may be necessary to learn some new skills, invest in some new workshop equipment, or seek professional assistance. Many simple repairs are well within the capabilities of the amateur workshop. 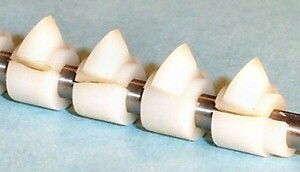 The illustration shows a home-made replacement for a damaged carry actuating pin from a 90-year-old pinwheel calculator. The new pin (top) measures only 1.4 x 1.7 x 15mm, and was made in an hour with nothing more than a selection of files. (Removing and re-fitting the pin, however, took most of an afternoon). More complex tasks such as re-bushing bearings and pivots, brazing broken levers, repairing stripped screw holes, or replacing broken teeth on gears are generally best left to the experts. A skilled machinist or clockmaker can repair or re-manufacture most mechanical parts, but until calculators become as valuable and as much appreciated as clocks, the cost of such assistance will generally be more than the machine is worth. While it is generally possible to reassemble a machine by exactly reversing the order of disassembly, this is rarely the best or most efficient method. While you were taking the machine apart, you would surely have noticed things that could have been done better in a different order. Before starting reassembly in earnest, it helps to make a number of trial assemblies to see which is the easiest and most efficient method. These may involve finding the best sequence to assemble a small group of levers, or larger experiments to find whether (eg) the back or the sides should be installed first. It will probably be necessary to back-track many times, so don't bother with fasteners or lubrication at this stage. As you experiment with the trial assemblies, try to imagine how the job would have been done in the factory. Look for groups of parts that can be pre-assembled into modules or sub-assemblies, and for ways in which they can be tested before installation into the machine. Think about what jigs or special tools might have been used, and whether it might be worth making something similar. A lot of tedious operations can be made much easier by fashioning a simple tool or fixture from a piece of wood or wire, or by doing things in a slightly different order. Once you have cleaned and checked all your parts and decided on the order of assembly, the actual process will usally go fairly smoothly. Refer constantly to your original notes and sketches, and make any additions or revisions that are necessary. At the same time, make a new set of brief notes to record the actual sequence of steps as you proceed with reassembly. Keep the notes when you have finished in case the machine needs attention in the future, or write them up and publish them for the benefit of others. You may find areas where your original notes prove to be insufficient for reassembly, and you will need to revert to "first principles" in order to proceed. Study the parts in the group in question, their relationships to their neighbours, and what they are meant to achieve. Every part is there for a reason and has a specific function to perform. Once you understand its purpose, its alignment or timing requirements will become clear. Solving these little puzzles is made much easier if you keep the groups small on disassembly. As most of the problems in a vintage calculator are generally caused by the oil, the choice of suitable replacement lubricants is clearly an important decision. Most of the oils and greases that were originally specified by the manufacturers are no longer available. I have approached several oil companies for advice on suitable alternatives, but these are rarely available in less than "industrial" quantities. As I have no knowledge of what may or may not be available in other parts of the world, I can only offer some very general remarks on the selection of lubricants. A pure light oil should be used to lubricate small parts during assembly, and a light grease for gears and heavier parts. Neatsfoot oil and other animal-based products that were used into the 1930s are still available, but they tend to be smelly and can turn rancid in hot weather. Modern oils with a high proportion of additives (eg 3-in-1 or WD-40) and clay-based greases are widely available, but the general consensus is that they are probably best avoided. "Sewing machine oil" is often recommended, but I find that the varieties available in this country evaporate rather too quickly. This is probably a deliberate design choice - sewing machines are intended to be lubricated regularly by the user, and the constant addition of new oil helps to wash out any old or decaying material. It is a good choice when parts are readily accessible for re-lubrication, but may be too short-lived for general use in a calculator. I have had some success with the "natural" oils and greases used by some clockmakers (Moebius 8040 and 8200), but even clockmakers have their disagreements about suitable lubricants. I have also used several other oils which have caused machines become stiff and sticky within a year of overhaul. I tend to think that a light oil which evaporates cleanly is preferable to one which thickens with age. My present method of lubricating during assembly is to wipe steel parts and springs with a (slightly) oily rag to help prevent rust, and to apply oil to bearings and pivots with a small brush or needle. Calculator service manuals generally advise to lubricate sparingly and to guard against over-oiling. Some small parts may be better left without oil if there is a chance that it would slow their movements. I would be interested to receive any feedback on this topic, or comments on your experiences. 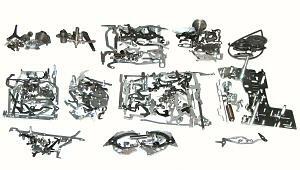 As you assemble each group of parts, check constantly to ensure that everything engages properly and moves freely. If anything becomes stiff or sticky or fouls against its neighbours, it must be corrected before proceeding. It is best to find these problems as soon as they arise, rather than after they are buried deep inside the machine. Functional checks of each of the "simple machines" should be made as soon as practical. Sometimes it may be helpful to temporarily install a missing part, or simulate its operation, rather than waiting until it is permanently installed much later. Adjustable components can often be set more easily when the machine is only partially assembled. Check the basic add/carry mechanism by adding 123456789 ten times and checking that the result is 1234567890. Repeat for 987654321. Repeat for subtraction. Check the ripple carries (and the "fugitive one" mechanism on printing calculators) by clearing the machine and subtracting 1. Verify that the ripple carry proceeds smoothly across the whole accumulator (or as far as the carry mechanism extends). Add 2, and check that the result is +1. On automatic machines, multiply 2 by 2 in each position of the keyboard (ie, 2x2, 20x20, 200x200, etc) and check the results in the accumulator and counter. Shift the carriage to ensure that all accumulator positions are tested. Repeat for divisions. If the machine passes these checks, you can have a fair degree of confidence that the calculating mechanism is operating correctly. You should then proceed to check all of the other functions of the machine. After you have completed your overhaul and explored the capabilities of your machine, do not just put it back on the shelf and forget about it. A little on-going maintenance is always necessary to keep any machine in good condition. It was well known in "the old days" that a machine which had sat idle for 12 months or more would not operate as quickly or smoothly as intended, and would need to be washed out and re-lubricated before being returned to service. It is therefore important to exercise your calculator regularly, in all of its functions, to keep the oils and greases moving and prevent them from hardening in place. Periodic application of new oil to bearings and pivots will keep the lubricants in good condition, and will help to wash out any accumulating dirt and decay products. So long as the lubricants remain liquid, the need for another major overhaul can be postponed indefinitely.